Daman is a beautiful little city, which is surrounded by the states of Gujarat, Maharashtra and Arabian Sea on the sides. The place is home to a rich culture and a lot of history which dates back over 2000 years. The present is tinted in colors of enjoyment, simplicity, and festivity. Beaches around the area let it stand out as a centre of natural beauty together with hints of fun. What adds on to an unforgettable experience here is the shopping scene which ranges from leather products, exquisite brands of liquor to handcrafted items. Also read: Engrossing Facts About Daman! Best Time To Visit: Daman is a year round destination. Although the best time for visiting Daman is between October - April, when the ambiance is heavenly and the climate pleasant. One can also visit the place during the Nariyal Poornima festival which falls on August 7th this year. By Air: The nearest domestic airport is located in the Nani Daman area, which has regular flights to Mumbai and Baroda. Chatrapathi Shivaji International Airport is the nearest international airport, located at a distance of around 170 km from Daman. By Train: Located around 12 km away from Daman, Vapi is the nearest railway station, which is connected to the major cities of Maharashtra. It is linked to cities like New Delhi, Bangalore, Mysore, Jamnagar, Chennai, etc. By Road: One of the best ways to reach Daman is by road. The town is well connected by roads and there are regular buses which operate from major cities to Daman. The total driving distance from Mumbai to Daman is around 177 km. Those who want to opt for Route 1, it would take you approximately around 3h to reach Daman, via NH 48. The route takes you through the well-known towns of Thane, Manor, etc. The roads are well-maintained, which helps one to cover the distance at a good pace and the distance is about 177 km through this route. If you opt for Route 2, it would take you approximately 4 h to cover a total distance of 208 km from Mumbai to Daman, via NH 160 and NH 48. If you opt for Route 1, an early morning start from Mumbai is a must for two reasons: one to beat the city traffic and second to beat the highway traffic. As you hit the highway there are plenty of options for one to relish on from the delicious local cuisine to almost any type of cuisine. Manor can be an ideal stopover for some delicious breakfast; after a filling breakfast, one can go around the place. The place is also known as 'The Gateway to Palghar' and offers a very peaceful ambiance for a pleasant stay. The town, located on the banks of the River Vaitarna, is famous for its earthenware goods, which are manufactured in huge numbers here. Daman's abundant coconut groves, the calm and peaceful shore, the blissful temperate climate round the year, makes it a graceful place on the western coast of the Indian subcontinent. This magical land beholds all those who visit in its enchanting spell, compelling them to take a trip there again and again to relish its delicate and subtle beauty. For the peace-loving, the Devka Beach here is a perfect place for one to take a relaxing walk across the seashore and if you are looking for some adrenaline rush head straight to the Bordi Beach and get your hands on parasailing. Also known as the Nani Daman Fort, the most noticeable part of the place is its huge gateway which faces a river. 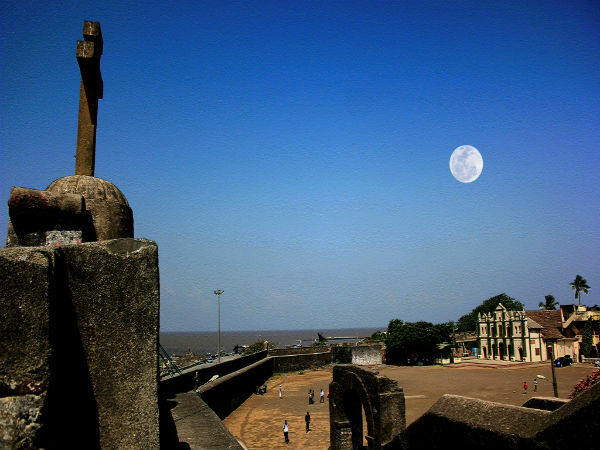 The fort complex is home to the Church of Our Lady of the Sea and a Jain temple. The structure also provides you with a beautiful view of the surroundings and the markets below. One of the most popular sights to see here is the Cathedral Of Bom Jesus. Constructed in the year 1603, the structure is a perfect example to showcase the grandeur of the Portuguese craftsmanship. One of the major landmarks in the city is the Lighthouse. Standing tall the lighthouse gives an breathtaking view of the sea and the sea traffic. The Lighthouse is located with in a fort which adds on further to its beauty.